Chastetree often draws attention to itself with aromatic, grayish-green leaves that look like marijuana. It garners even more interest when it blooms—now in June to September in the Southeast—with blue spikes of 3- to 18-inch long flowers. Pollinators find these flowers irresistible as well. Chastetree was recognized by the Greeks for its medicinal properties (they believed the flowers curbed lustful desires). Since 1570 the British cultivated it in their gardens as an ornamental. Native to east and south Asia and the Phillipines, chastetree is quite at home in the Carolinas where it revels in our heat and humidity. It’s also drought-tolerant, easy-to-grow, and has no serious pest problems. 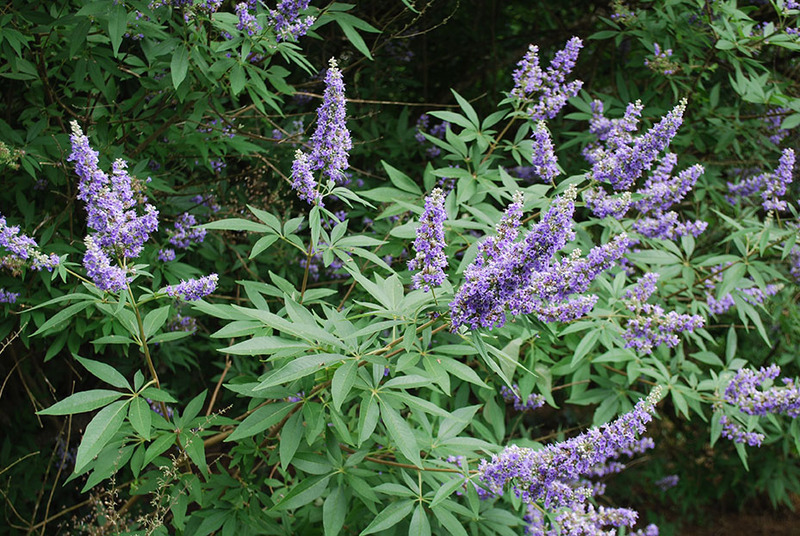 Chastetree can be cultivated as a multistemmed shrub by pruning it back to within 1 to 2 feet of the ground in late winter before new growth begins. You can also maintain it as a small deciduous tree that will reach a height of 10 to 15 ft. or more. For the best floral display, site it in full sun. There are several cultivars to choose from that include ‘Blushing Spires’, a blush pink; ‘Rosea’, pink flowers; ‘Silver Spire’, white; ‘Shoal Creek’ produces spikes of vivid blue flowers up to 18 in. long; and ‘Montrose Purple’ has rich violet flowers. Try any one of them, and you’ll be hooked. ← For watermelon lovers only….